San Diego (June 6, 2017): U-Bruu, a household countertop draft beverage dispenser poised to be the next ‘it’ product, has launched on Kickstarter this week. The campaign exceeded its initial $39,000 goal in the first few days. The U-Bruu’s proprietary flavoring system utilizes similar technology that catapulted the beer and coffee industry from mom –and-pop purveyors to multi-billion dollar industries. 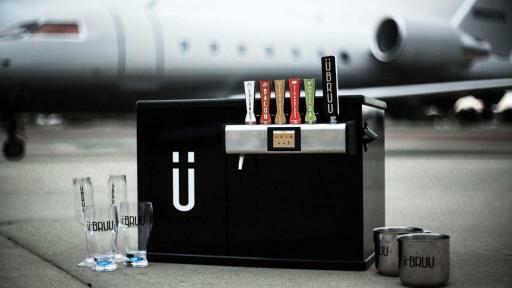 The U-Bruu taps any standard bottle from 12 to 64 oz, including beer, sparkling wine and soda. Because of the nitrogen component, it also creates creamy cold-brew coffee. Unlike a refrigerator that uses ambient cold air to chill a beverage over time, U-Bruu features an adjustable coil temperature control that uses a freezing coil to cool, so a warm beverage can be inserted into the machine and be dispensed at perfect cool drinking temperature immediately. “The sleek, modern design consolidates several beverage machines and makes it an ideal addition to any home or office, from the beer love to the coffee drinker to the health guru,” said Bruton. Kickstarter packages range from $25 to a $10,000 package that includes 2 U-Bruus along with a trip from Carlsbad, CA, to Las Vegas, NV, on a private jet and a one-night penthouse stay at The Palms Hotel. The machine is being offered on Kickstarter for $200 which includes the unit, a 30-flavor starter pack, drink recipe book and Co2 and Nitrogen cartridges. For more information, visit our Kickstarter or website at www.UBruu.com.